Keep Calm and Fly Fish: Is It Prime Time? I recently fished the Feather River for steelhead and didn't have much luck despite waking up at 5am and being the first on the river. I didn't get skunked because of the pike minnows but I didn't get any steelhead. 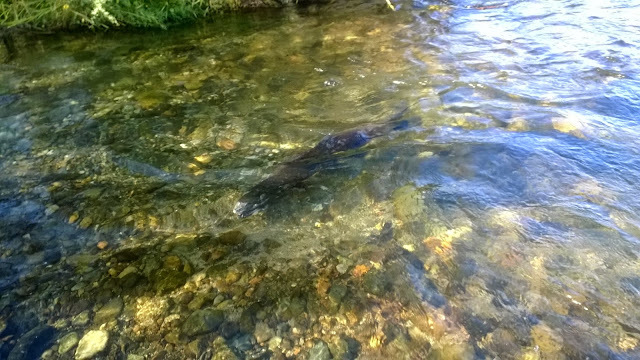 The salmon are pairing up and scrapping redds throughout the low flow. The event is pretty amazing to watch and wade through because you can get extremely close to them and observe as they chase each other up and down all day. Watch your step though! To conserve the fishery, anglers must respect the salmon and do the best we can to try and not interfere with their ritual of spawning. I later explored One Mile Pond/Vance Pond and found it a pretty neat place. A lot of bluegills and bass inhabit the pond. There are also a lot of weed beds that would make it a great place to throw frogs. I'll have to try it someday. The only thing I don't like about the pond is the traffic around it. The Oroville Wildlife Refuge road is usually seldomly driven on which means you'll probably see less than two vehicles the entire time especially on a weekdays. I must have seen like 6-8 vehicles pass while I was fishing. It made me wonder where everyone was going. A lot of the drivers didn't look like anglers to me. Not a very safe place to leave your car and go too far in my opinion not with all the hooligans out there in Oroville. Sorry, but the steelhead are in an another run.